As a consultant working with leaders and their teams, I have the opportunity to observe many leaders and how they choose to lead. In doing so, I have come to recognize qualities and behaviours that contribute to or detract from people and organizational performance. As you review the following, consider the influence you have to engage and impact those you lead. Research shows that when people leave their jobs they rarely leave their companies; they leave leaders (Gallup Organization). This should act as motivation for learning about how to bring your best leadership qualities to your team. Kicking off this two-part “Reflections on Leadership” blog, here are 5 tips that support effective leadership. Too often I’ve worked with leadership teams and witnessed what I call the “Peacock” effect. This is when leaders bring too much of their egos to the table, talking it “up” to make themselves look good. Their focus is more on self than others. The behaviour is marked by more talking than listening. The risk of this behaviour is that it prevents the real and necessary conversations from occurring. Trust: Leaders demonstrate to their team the value of ego over being genuine. It makes it hard to trust this kind of person. These leaders are modelling this behaviour as effective in leadership (and it’s not!). Proper decision-making: It can negatively impact appropriate decision-making due to too much talking and not enough information gathering and checking understanding. Leaders lose competitive edge when they are not in possession of accurate information. End result is ineffective meetings, lost time and overall, huge costs (direct and indirect) to the organization. How much do you talk versus listen in meetings? What can you consider doing more of? Less of? What two actions can you take that bring more vulnerability and genuineness to your conversations with staff? Clarity of vision, performance expectations and organizational direction are critical for employees to perform effectively. I have witnessed time and again what I call the ‘wishy washy’ leader; not communicating or inspiring others with his/her vision and direction. Often, these leaders are frustrated and confused by their employees who just “don’t seem to get it and are not on board”. Engagement: Employees reporting to this type of leader can become disengaged and distracted; they are unclear of the link between how their job supports the big picture and overall department or organizational direction. Team spirit: Followers need a compelling vision and direction to be inspired and engaged. This motivates people to get ‘on board’ and build team synergy towards a common goal. Without this focus, people tend to work in silos, which fosters internal competition for power and resources over collective collaboration. Clarity: Lack of clarity can easily contribute to confusion, team dysfunction and unnecessary (and unhealthy) competitiveness and politicking amongst your employees. How are you doing at communicating your vision? The direction you want? What more can you do to build better collaboration amongst your staff to reach your vision and goals? What two actions can you take that will contribute to greater clarity of your vision/direction? I cannot say enough about the importance of effective, constant, and consistent communication. Too often I hear leaders state that they are too busy to communicate with their staff. During significant organizational change, I’ve witnessed leaders who choose not to communicate with their employees because they have no new information to provide and fear not being able to answer employees’ questions. My mantra is “you can never over communicate”. Frequent and clear communication builds trust, employees’ confidence, and higher employee engagement. Rumours: Human beings are good at making things up; we are meaning-makers. In absence of clear, direct communication we fill in the gaps with our own versions. Typically these versions are far worse than reality. These contribute to rumours forming and, believe me; communication needed to clear up rumours is far more extensive than being proactive by anticipating and communicating clearly (and consistently) with your team. Performance & Productivity: Absence of communication contributes to employees lacking clarity and stumbling about trying to figure things out. This can, in some cases, lead to performance errors and unnecessary conflict. Absenteeism & Turnover: Lack of communication can lead employees to feel quite isolated and fearful of their own jobs. This, when not proactively managed, can lead to absenteeism and turnover. Consider how often you think “I don’t have time for this”…how real is this statement versus habitual? What are you holding back on that you could be sharing with your staff? What two actions can you take to provide updated and clear transparent communication with your team? Leaders with strong emotional intelligence (high EQ) demonstrate far more empathy than those with low EQs. Emotional intelligence has become a management buzz word in the past decade and, ultimately, what sets these leaders apart from those who lack EQ is their ability to tune into others from an authentic place of listening. High EQ leaders consider people impacts when making decisions and driving change. Leaders who are purely focused on goals at the expense of their employees may reach their short-term milestones but the costs (the people/the culture) are huge and the organizational success is often short lived. Retention: People want to be understood and feel a sense of belonging – be it in their personal lives or at work. Lack of empathy from a leader can lead to feeling isolated. The impact can be that employees will do the bare minimum and, in the long term, employees disengage and turn-over increases. Culture: When leaders drive key decisions and changes within their department or organization and don’t take into account the impact on their employees, the result is resistance. Unaddressed resistance can drive higher project costs, undermine credibility, and seep into the long-term organizational culture. (See William Bridges on Change & Transition). Adaptability: Leaders who do not practice empathy tend to be less able to respond to and adapt to emerging issues and challenges. Too much lag time or ineffective responses will eventually damage their relationships with customers and their ability to attract/retain talent. Low EQ leaders miss opportunities and cues that could influence some key adaptive actions that would keep their competitive edge. What’s your approach to listening from a place of non-judgement, openness and curiosity? What can you do more of to build your ability to ‘tune in’ to the needs of your team members? What two actions can you take to develop your EQ and help you better anticipate emerging issues/challenges? 5. Bring on the people-skills! This is a virtue I continue to instil in my teenage son as a quality that will set him apart from others. Certainly this can be harder to manifest for those who have a more introverted preference (like my son), but the payoffs are great. I have witnessed the polarity of this in the leaders I work with. There are those who are incredible at talking to anyone within their organization and there are those leaders who enter a room and only communicate with their immediate circle –creating a sense of ‘us and them’ and reinforcing a culture of rank. 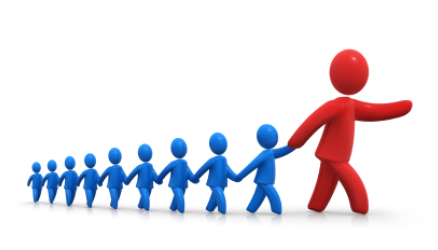 Commitment: Employees want to feel their leader is approachable. Leaders who don’t connect easily with their staff contribute to employees feeling under-valued and this can lead to disengagement. Engagement: Leaders lacking skills to truly connect with others may be excellent administrators and ‘getting things done’ but may lack the ability to engage and inspire others to want to be part of their mission. This solo journey may be effective for the ‘task at hand’ but can hinder the ability to build a growing network and partnerships. Loyalty: The quality of being a people person is a subtle yet important differentiator in terms of generating loyalty from others (employees, customers, and partners). How do you rate your people skills in terms of engaging and inspiring those you lead? What areas can you develop more of that allows your staff to feel comfortable with you and that you truly are curious about them? What two actions can you take that will make a difference in enhancing or developing your people skills? Leadership approaches can be modified; it’s the elements described here that can make a difference to being more than just a good leader…. and actually being a great leader. Use these principles as a way to validate what you know you are doing well, challenge the areas you have seen are weak and encourage and inspire you to be GREAT. A final thought. If you are a leader reading this YOU MAKE A DIFFERENCE to those you lead. Use this gift wisely. Don’t take your role for granted. Continuously reflect upon what you can do to bring best practice leadership to the forefront. Stay tuned for more Reflections on Leadership –Part 2 coming soon. 9 Comments for "Leadership Practice – Reflections on Leadership – Part One of Two"
Love this posting, Erica. Thank you for the great reminders. I recently had some experiences with a peacock in a client organization. The dysfunction is created was sad to watch. Thanks Mike. Yes seeing the dysfunction occur due to the lack of leadership is really hard to observe. This is a concise but very helpful and comprehensive article relating to leadership and reflection upon ones leadership style. Thank you for posting and I look forward to receiving part 2. In my consulting practice and while working at companies, I found that what you say is true. Most important, it seems to me, is a simple message from the top: These are the five things we will accomplish and these are what we will talk about and act upon. The behavior is very important: who gets promoted, who gets hired, who gets demoted or fired tell more about the leader than the speeches. Changing pay structures will also communicate what is important. Remember that compensation packages are designed to create an incentive to meet other goals. When the goals change, they pay system should change as well. We OD people often forget these two options. Erica ~ I so enjoyed reading this. I will use your ‘questions to consider’ for self-reflection and to prompt reflection and conversation with others. Thank you!